South of Chicago pizza restaurant forced out of Fletcher Place location? INDIANAPOLIS -- A popular Indianapolis pizza restaurant has been forced out of its location in the Fletcher Place neighborhood, according to its Facebook page. 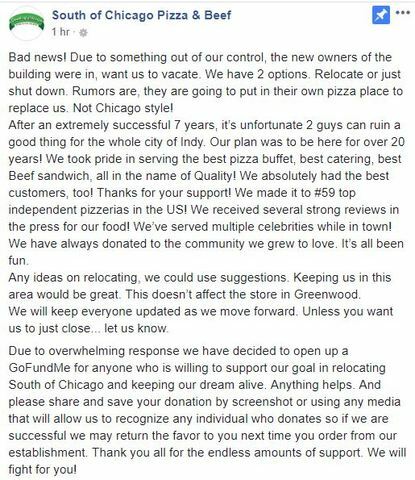 After seven years at 619 Virginia Ave., South of Chicago Pizza & Beef was given two options by the new owners of the building: Relocate or shut down, a new Facebook post by the restaurant says. "... it’s unfortunate 2 guys can ruin a good thing for the whole city of Indy," the post reads. "Our plan was to be here for over 20 years!" South of Chicago was one of the few restaurants serving Chicago-style pizza in Indianapolis. Another, Giordano’s, has two locations -- one in Castleton, another in downtown Indianapolis. It is unknown what will replace the pizza spot at 619 Virginia Ave., but it could be another pizza restaurant, according to the post. The restaurant manager says his attorney and the attorney for the building owner are in "negotiations" aimed at keeping the restaurant where it is. If not, South of Chicago hopes to fin a new location nearby. Late Friday, the new owner of the building spoke with the Indianapolis Business Journal and told them he has "no intention of getting rid of" the restaurant. We are trying to confirm with SBJ properties. Stay tuned.